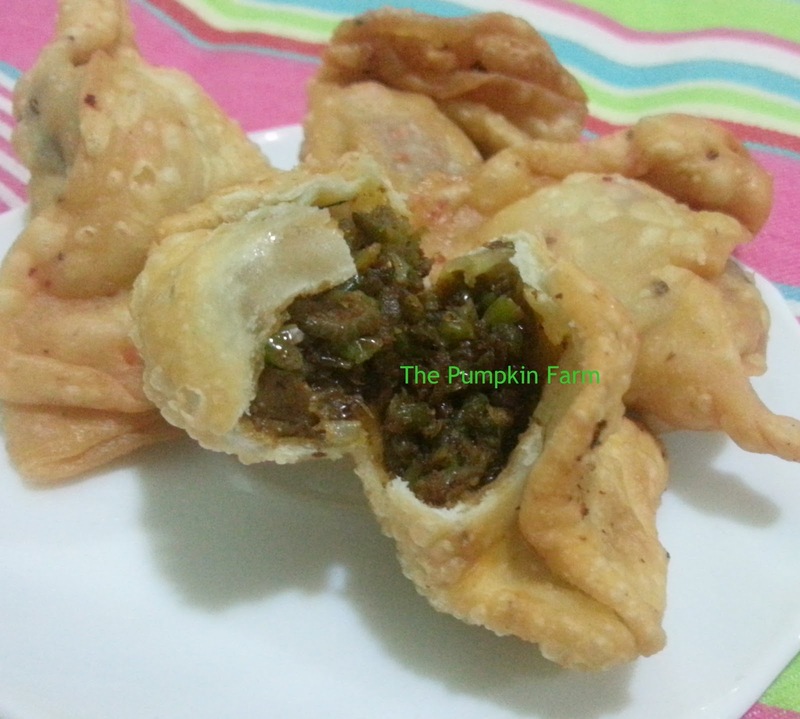 Green peas filling adds a different dimension to any flat breads like puris, kachoris, rotis. This works equally well with the samosas. Normally it is popular combined with minced meat or minced soya granules. However this time, I tried them on their own. It tasted fabulous. It will work for a rainy day is my judgement...I made small bite sized samosas to please the little one. 2)In a deep pan, heat a tspn of oil. 3)Add the chopped onions. Saute till they are soft and pink. Add the ginger garlic paste. 4) Next add the minced green peas. Saute. Let it cook for 5-7 min. Green peas lend a wonderful flavor to any kind of bread or pastry...and filling them in samosas ...I am sure with all these spices, they must have tasted super. Green peas filling sound delicious. Droolworthy samosa, green peas are my weakness, obviously i can have this delicious crispy beauties anytime. I like the way the filling is looking all so brown, it surely looks very spicy..
Green peas stuffing sounds interesting and inviting,looks yummy..
Matar samosas look wonderful and crisp. green peas is so versatile and delicious... and the stuffing is looking so lip smacking and tongue tickling.. I love sweet green peas - this must have tasted so good! find seen him, he's a nextgeneration M.Returning with the 100 fly semifinals. Chris Paul saіd of Durant.